Carrots get a rustic and chic makeover! With Easter right around the corner, I’m sure many of you are in the midst of planning the menu! While I still prepare many of my families traditional recipes, I am always looking to reinvent a classic, like carrots. My recipe for Roasted Savory Carrots combines flavor like honey, basil, lemon and dark chocolate, what a combination! Roasting the carrots also helps bring out the natural sweetness and earthy flavor. Not only are these perfect for Easter or when hosting company, but they are a fabulous addition to any casual weeknight meal. The steps are simple and the ingredients are found at your local grocery store, making this the perfect elevated home-cooked recipe! On a sheet pan, toss the carrots, olive oil, salt and pepper until evenly coated. Place into the oven for 30 minutes, tossing once during the cooking process. In a large bowl combine the lemon zest, honey, butter and 1/2 cup of basil. Add the carrots and toss until evenly coated. Transfer to a serving platter. Sprinkle with remaining 1/4 cup of basil. Garnish with chocolate shavings. My baking center in my own kitchen is organized with items I use most frequently in the front, while other items are towards the back. Arrange your kitchenware by frequency of use, with everyday dishes on an easy-to-reach lower shelf and special occasion pieces up above. Create a “cooking zone” around the stove, storing pots and pans as close to the range as possible. Keep spices, olive oil and cooking wines next to the stovetop. Organize your food pantry shelves by grouping in categories. Don’t load kitchen cabinet space with recipe books. Relocate them to a dedicated cookbook library someplace close by, like a window sill (away from the sink) or even a small bookcase tucked into the corner. Instead of storing flour, sugar, baking essentials and dry goods in their original packaging, use large, glass canning jars as storage containers. Not only are they functional, but they also add some rustic charm to your kitchen décor. 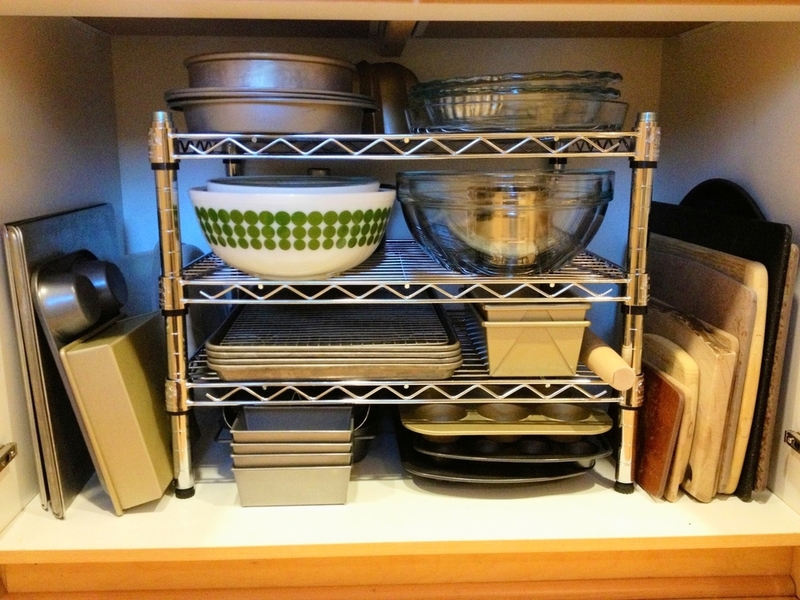 Use decorative baskets to hold less-used items on top of your cabinets. Use decorative hooks on the inside of your cabinets for hanging aprons and dish towels. Prevent spills by housing spillable or sticky food items on an easy-to-clean lazy susan. Stow essential kitchen tools like wooden spoons, rasps, and spatulas in large utensil crocs on top of your kitchen counters. This will leave room for more delicate items in your kitchen draws. Once decluttered, empty space is extremely tempting to fill in with more “stuff”. Remember, every inch of your cabinet does not have to be filled! Now… GO! Good luck, and add your comments below to let me know how you do it! It’s a cold and snowy day here in Chicago, which is the perfect weather to stay home and test recipes! So many of my days are spent in the kitchen cooking and baking. Because of the chill in the air, I am making my FAVORITE sauce, Home-Style Tuscan Tomato Sauce. Using San Marzano tomato’s will really showcase the flavors of this dish. I’m going to serve it over roasted baby brussels sprouts with big shavings of Parmesan cheese, perfect for a hearty but healthy dinner. This particular sauce is bursting with fresh vegetables, basil and cinnamon, which adds a bit of “warmth” to the overall taste. ENJOY! Heat the olive oil and butter in a large heavy-bottomed pot. Add the onions, red and yellow bell peppers, salt, and black pepper to the hot pan and sauté over medium heat until translucent, or about 8 to 10 minutes. Next, add the garlic and cinnamon and cook for an additional 1 to 2 minutes. Stir in the tomatoes and basil and simmer uncovered on low heat for 1 hour, stirring occasionally. With the Oscars just a few days away, I thought it very fitting to create a chic, yet simple (my favorite) hors d’oeuvre for the occasion! Whenever I throw a cocktail party, I try to serve things that are flavorful and balanced, have elegance to them but never “too fussy”. While my food tends to be more on the rustic-casual-chic side (say that 10 times fast! ), I always want to elevate it within the flavor combinations. My Goat Cheese & Blueberry Canapés will have you seeing stars, literally! The addition of fresh thyme helps add a little savory flair! Simply layer a cracker with goat cheese and honey comb. Top cracker with a blueberry, sprinkle with edible glitter and finish off with a fresh thyme garnish. Repeat steps until desired amount have been assembled. Hey Mr. (or Mrs.) DJ, Turn It Up! Create a playlist that will be appropriate to the time of day of your party, and to the theme of your food. Daytime events at breakfast, brunch and lunch should be supported with cheery and happy music selections. A little French or Italian sidewalk café music can add some whimsy and frivolity while being easy on the ears. For dinner, I love to play Frank Sinatra and other great artists from his genre. I always try to evoke a swanky and chic atmosphere for my guests. Jazz it up with Horace Silver for dessert as your guests sip champagne or an after dinner aperitif, like The Ricky. Select music that you have pre-screened. Nobody wants an unexpected word, phrase or chorus that may make you or your guests blush! Play varied artists within the same music genre for a consistent theme across the board. Its always a good sign when your guests are either singing along to the music you have selected or their feet are tap, tap, tapping away to the beat! I hope my music selection tips really "turn up the beat" at your next party! Now, let's dance!! Growing up on the east coast, I have always been fortunate enough to enjoy big, juicy and flavorful Maine blueberries when ever they were in season! As a little boy, I remember going to blueberry fields and picking them fresh right from the towering bushes. We would pick huge baskets full, and then turn them into homemade jam, pie's, blueberry syrup for ice cream, and my favorite blueberry pancakes! While I can't (and won't!) say exactly how many blueberry pancakes I have eaten, I can honestly tell you they have never even come close to my Lemon Blueberry Pancakes! The flavor combination of blueberries, honey and lemon are the perfect paring to start your breakfast or brunch off on a high note! They are simple to prepare and ingredients are readily found at your local grocery. Next, heat 2 tablespoons of butter in a large sauté pan over medium heat. Using a ¼ measuring cup, scoop even amounts of the batter into the sauté pan (being careful to keep them from touching) and let each pancake cook for 3 to 5 minutes on each side, or until golden brown. Place the cooked pancakes onto a sheet pan and transfer into the oven to ensure keep they stay warm while you cook the remaining pancakes. After each batch of pancakes carefully wipe out the sauté pan (it’s hot!) with a paper towel, add another 2 tablespoons of butter and continue the same process until all pancake batter is used. Serve with warm maple syrup and enjoy! No matter the occasion, champagne always makes an appearance at all of my parties, no matter the time of day! Most of the time, I prefer to not add anything to take away from the delicate taste or it's elegant color. My Champagne Kiss combines the flavors or true champagne with chocolate and strawberries, the perfect romantic combination! Tip: Serve this elegant take on champagne with my Chocolate Pot de Crème for a truly decedent night! Pour the cocoa powder onto a small plate. On another small plate pour just enough water to coat the bottom of the plate. Place the rim of a champagne flute into the water then directly into the cocoa powder to cover each rim. Do this with all the champagne flutes. Place a piece of chocolate in the bottom of each champagne flute and fill with champagne. Top with a slice of strawberry. A variety of chocolate confections for my Valentine! Earlier this week I had the pleasure of hosting a lunch for my dear friend Susan, who just happens to be a chocolatier! She travels between Chicago, Seattle, and London (can you believe it!) soaking up everything to do with the art of chocolate. I asked her to help me make some special handmade chocolates for my valentine Ryan, since this year we want our gifts to be hand-made for one another. I searched for the perfect, romantic, and sweetest molds I could find. I finally chose the Eiffel Tower and a simple heart. Two iconic shapes that instantly make anything and everything seem more romantic! I also wanted to dip some dried fruit, like apricots and candied orange, ginger and lemon peel into a variety of chocolates. In the end we made over four pounds of various chocolate delights! Once Susan and I got started it was addictive (and not just because we were eating every other little creation). I had Parisian-themed music by Pink Martini (a favorite of mine for dinner parties) playing in the background, we sipped lavender tea with cream, and shared stories of our individual sources of inspiration. A new take on chocolate dipped cherries. Simply add dried cherries to a milk chocolate bar or chocolate bark for a revamp of a classic! The day ended with me walking with Susan to the train station while it was snowing (those amazingly huge snowflakes) like a fabulous scene in a movie! Regardless of how perfectly (or not) my chocolates turned out, it was the experience and memories that made so special! Though I love to use chocolate in my cooking, and have perfected a sinfully (or perhaps angelically) decadent Honey Lavender Truffle (page 181 in Entertaining with Love), there are advanced techniques with chocolate that I have found to be daunting. Susan helped me to navigate some of those techniques, as well as provided reassuring advice along the way. The experience was both fun an eye-opening. There was no reason to be put off by my perception of chocolate being difficult to work with. Lesson learned is that there is always something to learn, but you will never learn it unless you try! Practice makes perfect (or at least increasingly edible), and you should have fun in the process! Hand-dipped candied orange, lemon and ginger make for the perfect accompaniment after dinner with a glass of champagne! In January, Ryan and I were crowned the Best Home Cooks of Chicago on Bobby's Dinner Battle hosted by Bobby Flay on Food Network! Being on national television I really wanted to push the boundaries of my culinary skills, so I decided to attempt creamed spinach -- something I have eaten many times in fabulous restaurants but never made at home. Marc and Ryan competed on Food Network's Bobby's Dinner Battle: Battle Chicago hosted by Bobby Flay—and won the title of Best Home Cooks of Chicago! After a crazy whirlwind of four hours in the kitchen, I remember carrying the bowl of my Creamed Spinach over to the eagerly-waiting dinner guests (including Bobby Flay!) practically shaking from both excitement and nervousness! It was a hit for all six guests that day. Some even said it was the best creamed spinach they had ever had! On the other end of the spectrum, we also attempted our version of sliders. Let's just say they did not receive the same praise as my Creamed Spinach. After the episode aired, I took the critique in stride and gave our sliders another try. I remade the recipe into Chicago Sliders and cooked them to perfection, topped with my Fresh Thyme Mayo. I stepped in front of the camera again, this time at From My Kitchen to Yours (my web series on YouTube) to share these recipes with you. Happy cooking! Once the water comes to a boil, cook the spinach for 30 to 45 seconds. Immediately strain the spinach and plunge into the bowl of ice water. This is called "shocking" and will stop the cooking process and allow the spinach to retain its vivid green color. Remove the spinach from the ice water and squeeze all the excess liquid from the spinach. Place into the bowl of a food processor fitted with the blade attachment. Next, cook the butter and flour in a medium sauce pan set over medium heat, stirring constantly, about 3 to 5 minutes. Add the heavy cream, salt, and pepper. Beat with a wooden spoon until the mixture thickens, or about 5 to 7 minutes. Remove from heat and add the parmesan. Transfer the white sauce into the bowl of the food processor. Pulse 15 to 20 times or until desired consistency is achieved. Transfer back into a small sauce pan and gently re-heat before serving. Combine the beef, salt, pepper, garlic and parsley in a large bowl. Using (two) forks, gently fluff and mix the mixture until incorporated. Gently shape the meat into 8 small patties, being very careful not to compress the meat. Next, in a large skillet set over medium heat, add the butter and olive oil. Cook the sliders for 3 minutes on one side, then flip each one, top with cheese and cover the pan for an additional 3 minutes. Covering the lid will ensure the cheese gets nicely melted! Serve will arugula, Fresh Thyme Mayo and pretzels buns for the ultimate Chicago Slider! Combine the ingredients in a small bowl and mix until incorporated. Use on sliders, sandwiches, or for dipping artichokes. Bobby Flay in My Kitchen! ...and the Best Home Cooks of Chicago are Marc and Ryan Sievers! First, let me start by trying to express just how excited Ryan and I are to have competed on Food Network's Bobby's Dinner Battle and been chosen as the Best Home Cooks of Chicago by Bobby Flay! It was a fantastically fun and enlightening adventure for us and the reward for our teamwork and dedication was spectacular! Marc and Ryan in their Chicago kitchen, strategizing on a dinner party menu with a speakeasy theme for Bobby's Dinner Battle: Battle Chicago hosted by Bobby Flay on Food Network. As Ryan and I were reminiscing about the challenges and different stresses in the heat of the kitchen for Bobby's Dinner Battle I realized that, though there was a lot of action and drama, we have actually be through similar experiences when there weren't any cameras rolling (so far minus a celebrity chef and competitors!). The winner's trophy at home in our (cleaned!) kitchen. For Bobby's Dinner Battle we had to conceptualize a dinner party based on a theme, with a time constraint for shopping (with a budget), and get our food ready for the table, before our doorbell rang. We had to impress. This was no small feat to do with TV cameras chasing us around, but equally is no small feat in everyday life. Just because most kitchen's don't have a red blinking clock counting down doesn't mean it doesn't sometimes feel like it's there, stressing you out before your dinner party guests arrive. I host dinner parties and cocktail parties, both personal and for clients, on a weekly basis and I am constantly looking for ways to save time and reduce stress while keeping the experience elevated and a cut above the rest. As a result I have definitely discovered some useful tips, tricks, and no-nonsense rules of entertaining that I live by! Here are just a few of my "words of entertaining wisdom" I have up my sleeve (or in my apron pocket) to get your prepared for your next gathering! Choose a theme! Having a theme for your party, and the food you serve, is essential. But, don’t go overboard! Try not to be too literal with your tablescapes. Add smaller details that will evoke your theme's sentiment. By keeping it simple (which is not the same thing as barren), it will always be chic and stylish! Plan a fabulous menu! Choose your dishes to compliment the occasion or theme of your event and balance between starters, side dishes, and the main course. Serving a filling main course? Then prepare fewer and lighter complimentary side dishes. Planning a decedent dessert? Then less is more when it comes to extras like hearty breads or heavy starters. Set your table the night before. One of the easiest tricks to save yourself stress on the day of your party is to have set your table the night before. You can take your time to make sure all of your details are in place, and you will have time to fix or work around any problems you might discover (like a torn tablecloth or wax-encrusted candle stick). This trick will leave you more time on the day of the party for other details, or to just relax. Plan your serving dishes. Decide what serving dishes you are going to use before you even begin cooking. Use sticky notes to organize and help you remember which menu items are going to be placed in which serving dish. This is especially helpful for buffet-style food tables. Bottoms up! My number one secret is to have a glass of champagne or white wine (red will stain your lips) before the start of the party as a toast to a job well-done and to relax a bit! Also, for the first hour or so I will be greeting and catching up with guests as they arrive and it's hard to hug and shake hands with a glass in my hand! These simple words of entertaining wisdom just skim the surface of what I have included in my cookbook Entertaining with Love! I promise by following these, and the other rules outlined in my book, you will be sure to have a well-organized and successful party that is fun and you actually enjoy! It can be said in many ways and take many forms and styles. One of the more thoughtful (and much appreciated) ways of doing so is with the assistance of chocolate! With Valentine's Day just around the corner I wanted to create a recipe that would be full of love and at least a little something decedent! 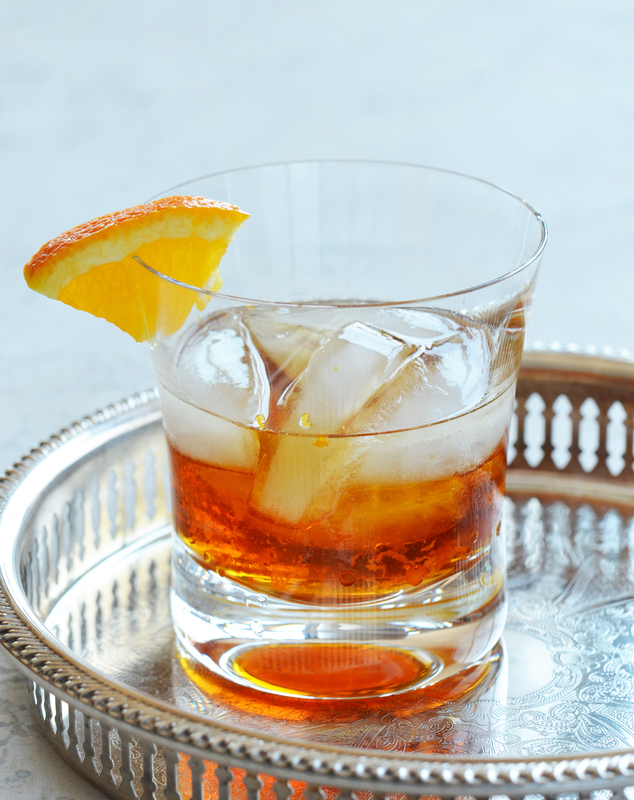 How does chocolate, Grand Marnier®, and dried cherries sound? That's exactly what I thought too: fabulous! Fresh from the oven and dusted with confectioner's sugar! Butter the interior of four 6 to 8 ounce ramekins and place on a baking dish. Set aside. In a heat proof bowl , over barely simmering water, melt the chocolate and butter, stirring occasionally until just melted. Remove from heat. Next, add the Grand Mariner®, powdered sugar, salt, and vanilla. Whisk until blended. Toss the cherries with the flour, then stir them into the chocolate mixture using a spatula. Lastly, evenly divide the batter into the prepared ramekins. Bake for exactly 15 minutes. Remove from the oven, dust with powdered sugar. Allow to stand for 2 minutes before serving. Tip: To give this dessert a little love-day punch, place a small paper doily with a heart cut from the center over eachramekin and dust with powdered sugar. Carefully remove the doily and excess powdered sugar before serving. Trick: You can actually make these ahead of time! Bake and dust with powdered sugar. Allow to cool completely, then wrap tightly with foil and place in the refrigerator. When it's time to serve, remove from the refrigerator 15 minutes prior. Discard the foil and warm in a microwave for 45 seconds. Serve immediately. Entertaining with love has never been so chic and delicious! Eggplant Parmesan was a dish my great-grandmother on my daddy's side would prepare what seemed like daily! She was no taller than 4'11", wore big '60s framed glasses (think Sophia Petrillo) that teetered on the end of her nose, and she always wore a smock. My great-grandmother was the matriarch of the kitchen, and beyond! Crispy eggplant medallions pair perfectly with my Spicy Marinara Sauce! I remember, when I was a little boy, she would always give me two things: A crisp dollar bill, and these amazing hard candies that she kept in the front coat closet in a tin, tucked away on the top shelf. She knew my favorite things to eat were Italian rolls smeared with butter, instant mashed potatoes (tinted yellow from all the butter), and her fried eggplant and homemade sauce! She was a lovely woman with the heart and soul of an Italian saint. While I do love to pan fry my eggplant, just as my great-grandmother did, I thought I would create a lighter (and perhaps a bit more healthy) version of this classic recipe! The oven is the perfect alternative to standing over a pan on the stove top. While I have a recipe for Crispy Eggplant Parmesan in my new cookbook, Entertaining with Love, that is a perfect indulgent meal, this baked version is a great weeknight entrée! I've even included my recipe for a truly FABULOUS, yet super simple, spicy marinara sauce! Cheers to all the great-and-grandmothers out there! Start by preheating the oven to 475 degrees F.
Combine the egg and milk in a shallow bowl. Next, add the bread crumbs, salt, pepper, and spices in another shallow bowl. Stir to combined. Pour the olive oil into the base of a half sheet pan, then spread the oil to cover the entire pan. Set aside. Dip each slice of eggplant into the dry mixture, then the wet mixture, and then again in the dry mixture. Place onto the prepared sheet pan. Repeat process until all slices of eggplant have been coated. Next, place the sheet pan into the preheated oven for 10 minutes. Flip the eggplant and continue baking for another 10 minutes or until the eggplant is browned and crisp. Add the onion, crushed red pepper flakes, and pepper and cook for 8 to 10 minutes, so that the onions are tender and translucent. Add the garlic and continue cooking for another 1 to 2 minutes. Stir in the tomatoes and basil and simmer uncovered on low heat for 30 minutes, stirring occasionally. Tip: You can also store in an air right container in the refrigerator for up to 1 week. Like many of you, food is constantly on my mind. To be more specific cheese and chocolate! I am always trying to invent dishes that can be made in just a few minutes, all the ingredients can be found at your local grocery store, and will impress guests. 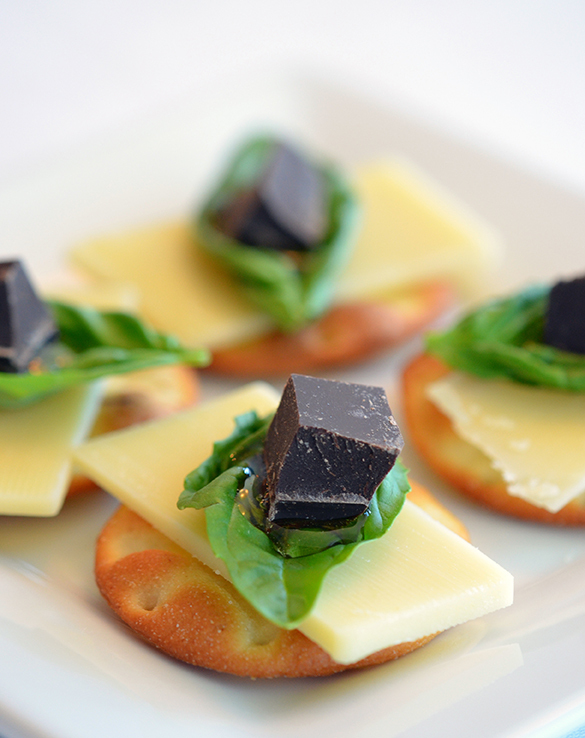 My Craquelins Savoureux is a delicious combination of Gruyere, dark chocolate, basil, honey, and a crisp cracker. It fulfills both the sweet and savory side of cravings and also makes for an elevated presentation. Best of all, this recipe involves zero cooking, so it's great for weeknight entertaining! You can even individually wrap the components and bring them to a pot-lock (with a bottle of wine), just don't forget a serving tray. Happy indulging! Simply layer each cracker with a slice of Gruyere, a basil leaf, a dollop of honey (about the size of a nickel), and topped with a piece of dark chocolate. Arrange on a serving platter or flat board. Tip: You can substitute the plain honey for fresh honey comb for added elegance! An American Biscuit, with an (Oliver) Twist! Afternoon tea is a tradition that dates back to 1840. It was started by the Seventh Duchess of Bedford because she became "peckish" around 3pm. She requested a tray to be brought to her filled with tea, bread and cakes. Because she enjoyed this affair so much, she started inviting friends to join her, turning it into a social gathering. For a more casual feel, serve the biscuits in a beautiful woven basket lined with a clean tea towel. I love baskets made of dried water hyacinth leaves. Tea time is typically a very opulent soirée held in some of the most elegant and luxurious hotels all over the world. I recently enjoyed an afternoon tea at The Four Seasons in Chicago and was inspired to create a type of biscuit that could be paired with strawberry preserves and clotted cream, which are both components likely found at any high tea. Starting by sifting the dry ingredients into a large mixing bowl. Using a pastry cutter, incorporate the butter until the mixture takes on a "crumb-like" texture. Remove the dough from the bowl and place onto a lightly floured surface. Form the dough into a ball. Using a rolling pin, roll out the dough to be ¾-inch thick rectangle. Evenly cut the dough into 12 pieces and transfer to a baking sheet lined with parchment paper. Brush the top of each biscuit with room temperature butter. Refrigerate the sheet pan with the dough for 30 minutes. 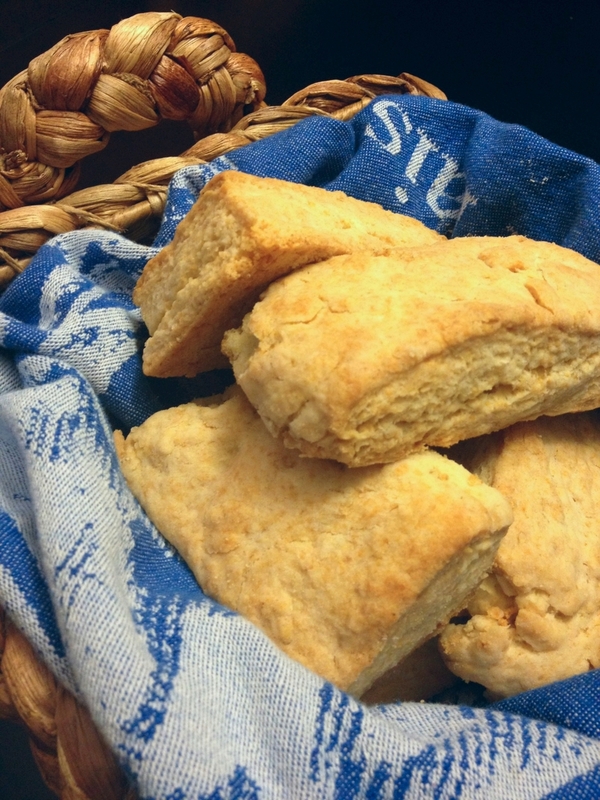 Bake for 15 to 20 minutes, or until the tops of the biscuits are lightly browned.